Greater Shepparton is at the heart of the ‘food bowl of Australia’, producing high quality fruit and vegetables and agricultural goods. Situated on the banks of the Goulburn River, Shepparton has the ideal climate and environment for food production. The city has a diverse and vibrant community contributing to a very strong economy and cultural scene. Part of the Goulburn region, Greater Shepparton is the fifth-largest city in regional Victoria in terms of population encompassing three main urban centres: Shepparton City, Mooroopna and Tatura. Three-quarters of the municipality’s population live in Shepparton and Mooroopna. 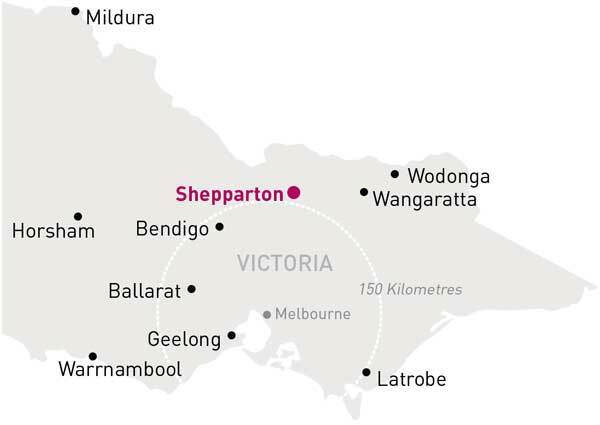 Shepparton is located approximately 180km north of Melbourne positioning the city as a major service centre for the Goulburn Valley and southern riverine area of New South Wales. Shepparton is synonymous with great food, wine, waterways and weather. The region offers a variety of lifestyles, with urban centres and country towns all within a half hour drive of the CBD. The region has an international reputation for quality fruit and dairy products, and is also home to some of Victoria’s oldest and best wineries. The Eastbank Centre in Shepparton is a magnificent concert hall and function complex, and is also home to the Shepparton Art Museum, which hosts local and touring exhibitions. Greater Shepparton’s growth has been associated with the development of agricultural industries such as fruit, dairy, cattle, sheep and grain production. It has about 6,165 businesses and a workforce of approximately 27,700 people. Greater Shepparton is a major fruit and vegetable processing centre, and also contains large dairy processing facilities providing products for both local consumption and export. In the five year period 2009-2014, there was strong employment growth in electricity, gas, water and waste services; health care and social assistance; accommodation and food services; public administration and safety and administrative and support services. Irrigation is critical to the region’s agricultural production and manufacturing. Other key industry sectors include Health care and social assistance and retail trade. Greater Shepparton is also an important transport hub in national supply chains. Shepparton is situated at the junction of the Goulburn Valley and Midland Highways, along the Newell Highway corridor that provides links to Melbourne and Brisbane. It is on the state rail network with both V/Line passenger and freight services. The Goulburn Valley Link freight and logistics centre will be located 2km south of the Midland Highway in Mooroopna. It will consist of a terminal for the transfer of freight between truck and rail, and general freight area to provide direct rail access for the Goulburn Valley to the Port of Melbourne. The transport terminal will provide industries in the region with significant efficiency gains and strategic advantages to help maintain future export competitiveness. Greater Shepparton is identified as a station on the High Speed Rail route on the east coast of Australia between Brisbane, Sydney and Melbourne. The RDV information portal page has more detailed data and statistics on the Shepparton region and regional Victoria more broadly.